This sponsored post was on behalf of Burt’s Bees. All thought and opinions are my own. This S’mores Breakfast Parfait recipe is sure to make your mornings great! This delicious s’mores inspired recipe is loaded with Greek yogurt, protein powder, graham cracker crumbs, chocolate chips, and toasted marshmallows. A delicious and easy yogurt parfait to start your day! This S’mores Breakfast Parfait recipe is such a fun way to start the day. A chocolate, marshmallow, and yogurt parfait is full of flavor and easy to make! Is there any better way to start the day than with S’MORES?! If you ask me…no, there really isn’t. I’ve never been a morning person, but if someone wants to make me toasted s’mores as soon as I wake up, then I’ll gladly wake up at dawn. Unfortunately for us, S’mores aren’t exactly a breakfast food. 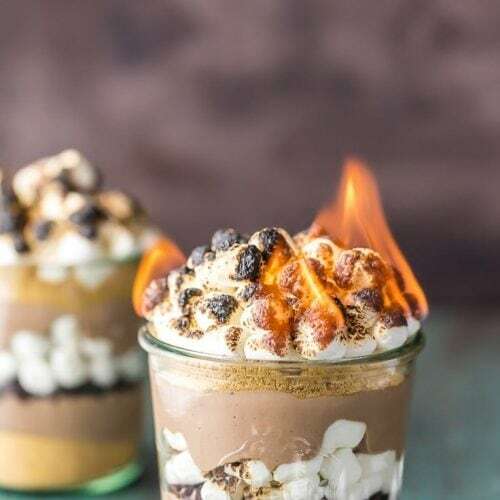 Chocolate, graham crackers, and marshmallows are more suited for after dark around a campfire…UNLESS you make this S’MORES BREAKFAST PARFAIT RECIPE that is! Made with Greek yogurt and protein powder, there’s really nothing to feel guilty about with this chocolatey breakfast. You can wake up craving s’mores and TREAT YOURSELF. Win win! This yogurt parfait is perfect for special mornings or a healthy dessert. And since it’s filled with protein, you can really feel like you’re giving yourself a good start to the day. 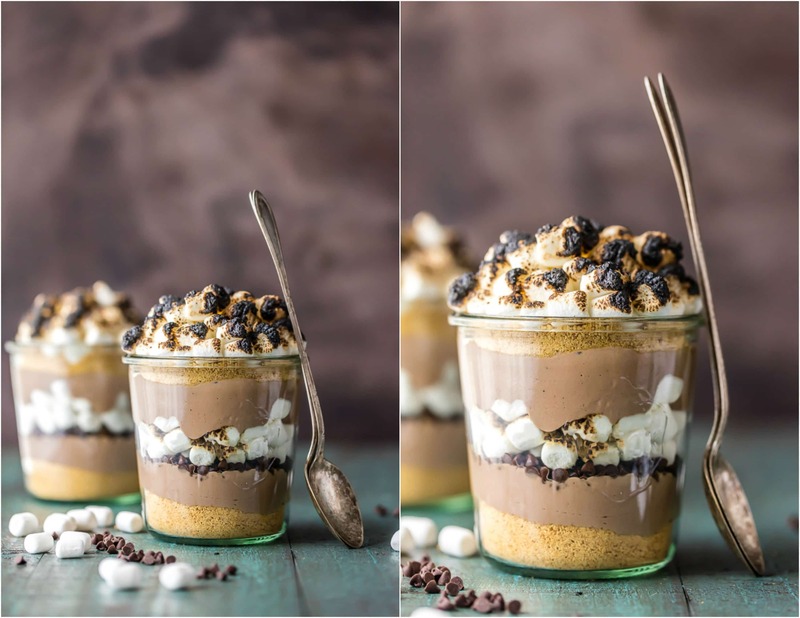 S’mores Breakfast Parfaits are the ultimate treat yourself breakfast! This yogurt parfait recipe is delicious and surprisingly good for you too. 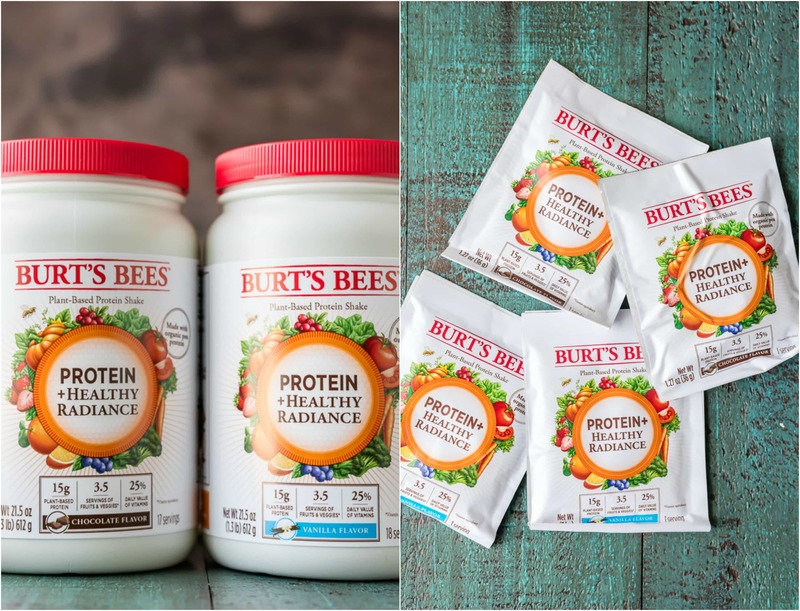 You guys might remember that last week I posted about one of my new favorite products, Burt’s Bees Healthy Radiance Protien Powder! I have loved Burt’s Bees™ ever since I first experienced their glorious lip balm. Nothing compares. So when I caught wind they were coming out with two flavors of plant based protein powder, I knew I had to try it. When you trust a brand that much, you try their new products. I have been LOVING the protein. It’s such an easy way to get some extra protein into your diet, while still enjoying the taste of what you’re eating! 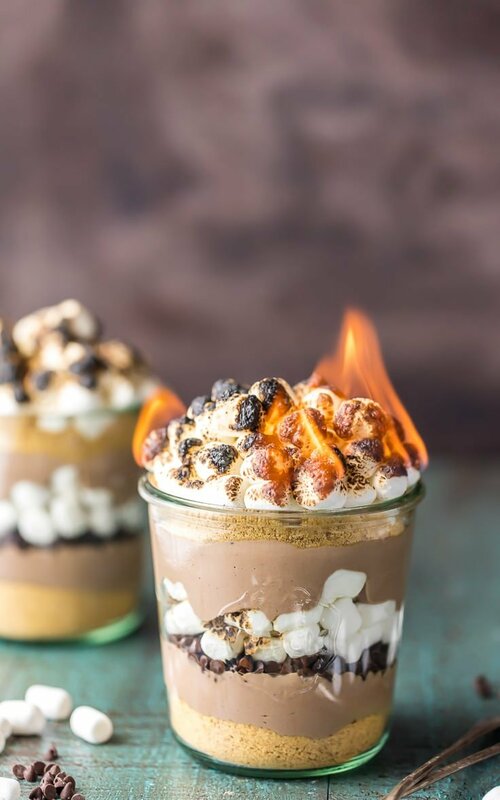 Last week I made a Pumpkin Pie Protein Smoothie (OBSESSED) using the Vanilla, and today I used the Chocolate in this S’mores Breakfast Parfait recipe. I simply mixed the chocolate powder with vanilla bean Greek yogurt to create the chocolate layer in the parfaits. A delicious and great way to start any day if you ask me! This stuff is hot off the press, you have got to try it! Chocolate and Yogurt Parfait…for Breakfast! 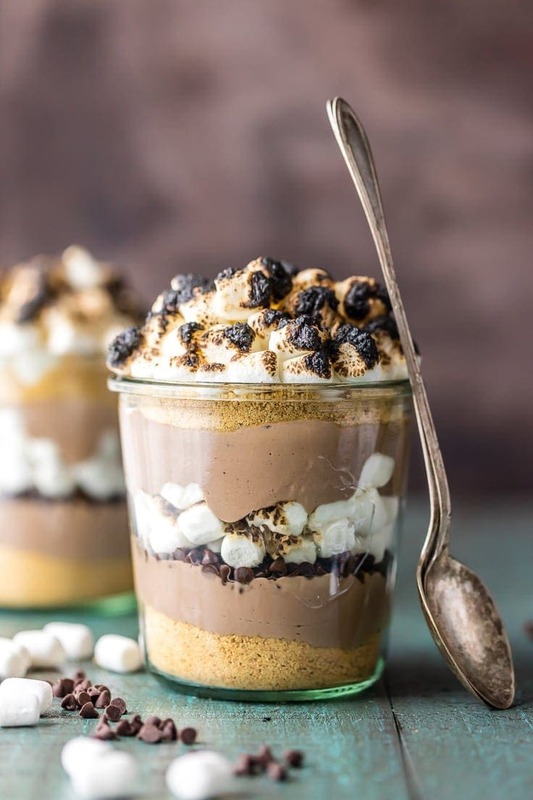 The chocolate protein yogurt parfait is layered with graham cracker crumbs, mini chocolate chips, and mini marshmallows. 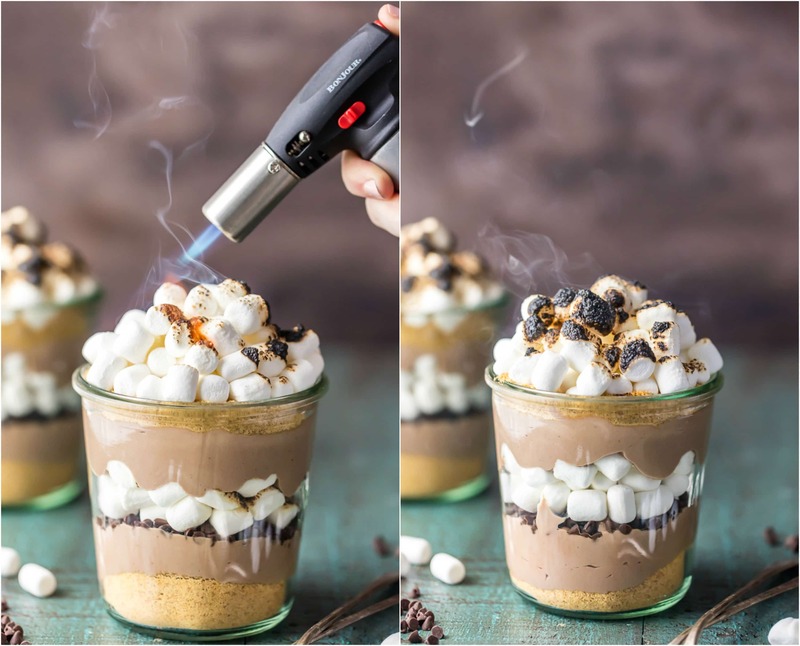 You can toast the marshmallows with a kitchen torch for an extra fun touch. Tastes just like you’re around that bonfire, but only in the morning…and in your own home. I love this! Not only is this s’mores yogurt parfait recipe delicious (SO SO delicious), but it’s really easy to make too. Yogurt, marshmallows, chocolate, graham cracker crumbs, and protein powder combine to make a fun breakfast recipe that everyone will love! This recipe makes 2 parfaits. You can use a kitchen torch to toast the marshmallows if you like! You can layer these yogurt parfaits in any order you like, and make them as big as small as you want. 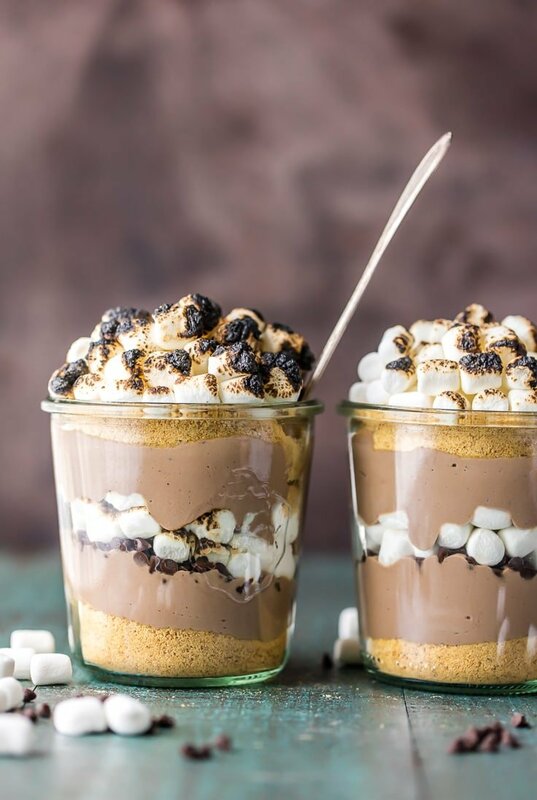 These s’mores breakfast parfaits are just so delicious, and so fun to make too! 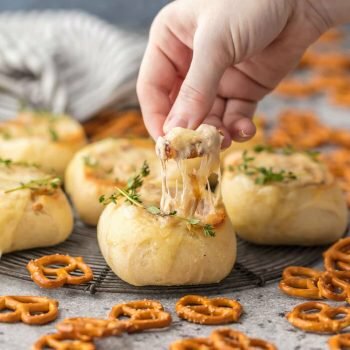 See the recipe card below for full instructions. Is there anything not to love about S’mores for breakfast!? This S’mores Breakfast Parfait recipe has it ALL and I can’t wait for you to try them. A fun yogurt parfait that everyone will love! See the recipe card below for details on how to make this S’mores Breakfast Parfait Recipe. Enjoy! This S'mores Breakfast Parfait recipe is sure to make your mornings great! This delicious s'mores inspired recipe is loaded with Greek yogurt, protein powder, graham cracker crumbs, chocolate chips, and toasted marshmallows. A delicious and easy yogurt parfait to start your day! 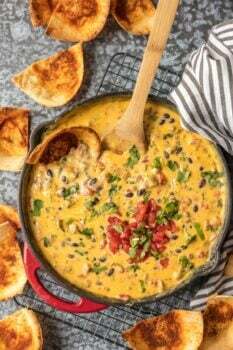 In a medium sized bowl, mix together the yogurt and protein powder until fully combined and smooth. If wanting to toast the marshmallows, use a small kitchen torch to toast the marshmallows to your liking. Totally optional, but fun! just as a heads up, Burt’s Bees company was recently exposed as one of that leading companies for harmful product testing on animals. Broke my heart.